Ephraim John Faulkner was born in Great Berkhampstead (Berkhamsted), Berkshire around 1835. A carver & gilder by trade, Ephraim Faulkner was operating an Artists' Repository and Cheap Stationery Warehouse at 59 East Street, Chichester, in the early 1860s. Faulkner's Artists' Repository contained a "Picture Frame and Gilding Department", where he carried out his main occupation. In addition to note paper, envelopes, and "stationery of every description", Faulkner also stocked leather bound photographic albums that held the increasingly popular carte-de-visite portrait photographs. In the 1866 edition of the Post Office Directory of Sussex, Ephraim Faulkner's business activities are detailed as "artists' repository, stationer, bookseller, photographic studio, and carver & gilder". Ephraim John Faulkner is listed as a photographer in Sussex trade directories from 1866 to 1870.The studio address is given as 31 & 32 East Street, Chichester. When the 1871 census was taken, Ephraim Faulkner was shown living with his wife and five children at 32 East Street, Chichester. The Head of Household, thirty-six year old Ephraim J. Faulkner, is described as a "Carver & Gilder", employing one man - a 20 year old apprentice from London named William B. Dickman. Ephraim Faulkner's wife, Mrs Celia Faulkner, gives her age as 33 and her place of birth as Salisbury, Wiltshire. In 1881, forty-six year old Ephraim Faulkner was still living with his family in East Street, Chichester and he is recorded in the census return as a "Carver & Gilder". Ephraim Faulkner was no longer employing an apprentice, but his two eldest sons, Frank and Walter, were assisting him in his business. By 1900, Ephraim Faulkner's business premises at 31 & 32 East Street, Chichester, was known as "Faulkner's Bazaar". In addition to his picture framing service, Ephraim Faulkner sold books, stationery, toys, china and glass. When the 1901 Census was taken, Ephraim Faulkner described himself as a "Stationer and Bookseller". Frank Faulkner, Ephraim's eldest son, and 19 year old Gertrude Faulkner, his youngest daughter, assisted their father in the Toys and Stationery department of the Bazaar. Two of Ephraim Faulkner's daughters continued the family's association with photography. Ada Beatrice Faulkner (born 1880, Chichester) is shown as a self-employed "Photographic Retoucher" in the 1901 Census. In the following year, Laura Selina Faulkner (born 1873, Chichester) married the photographer Gilbert Newton Futcher (born c1868, Newport, Isle of Wight) in Chichester [ Marriage registered in Chichester in the December Quarter of 1902 ]. Gilbert Newton Futcher had operated a photographic studio in Chichester between 1896 and 1898, but around the time of his marriage he was working as a portrait photographer in Bournemouth. Ephraim John Faulkner died in Chichester during the 3rd Quarter of 1908, aged 83. 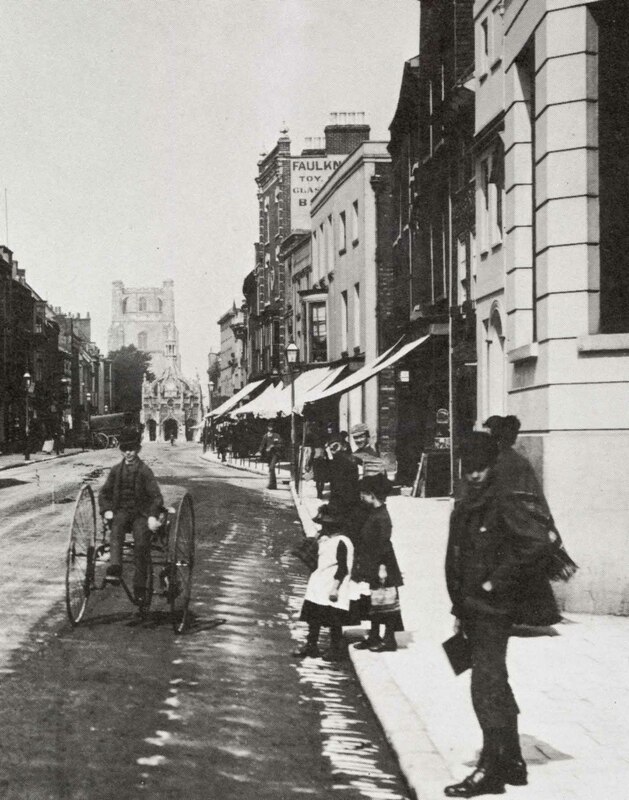 [ABOVE] East Street, Chichester, looking west (c1900). E. J. Faulkner's Bazaar at 31 & 32 East Street, the tall building in the centre of this photograph, sold toys, china and glass. Ephraim Faulkner was a carver and gilder by trade and ran a picture framing business in Chichester for over thirty years. Between 1866 and 1870, Faulkner operated a photographic studio at his business premises in East Street. [ABOVE] This cabinet photograph of "Mr. Faulkner" by Gilbert Newton Futcher of Chichester is probably a portrait of Ephraim John Faulkner. Mr Faulkner became Gilbert Futcher's father-in-law in 1902. [ABOVE] The reverse of a carte-de-visite portrait by E. J. Faulkner of 31 & 32 East Street, Chichester (c1870). 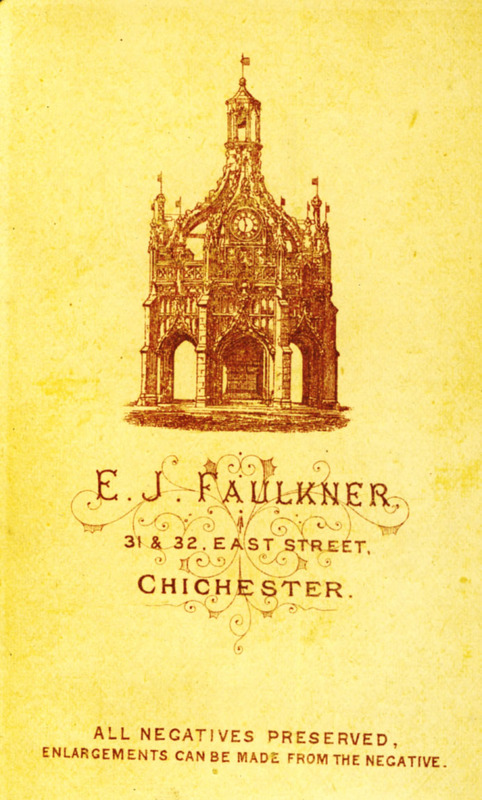 Ephraim John Faulkner, the proprietor of the studio, has used a picture of Chichester's distinctive Market Cross in the design of his trade plate. [ABOVE] This cabinet photograph of "Mrs Faulkner" by Gilbert Newton Futcher of Chichester is probably a portrait of Mrs Celia Faulkner, wife of Ephraim John Faulkner of East Street Chichester. 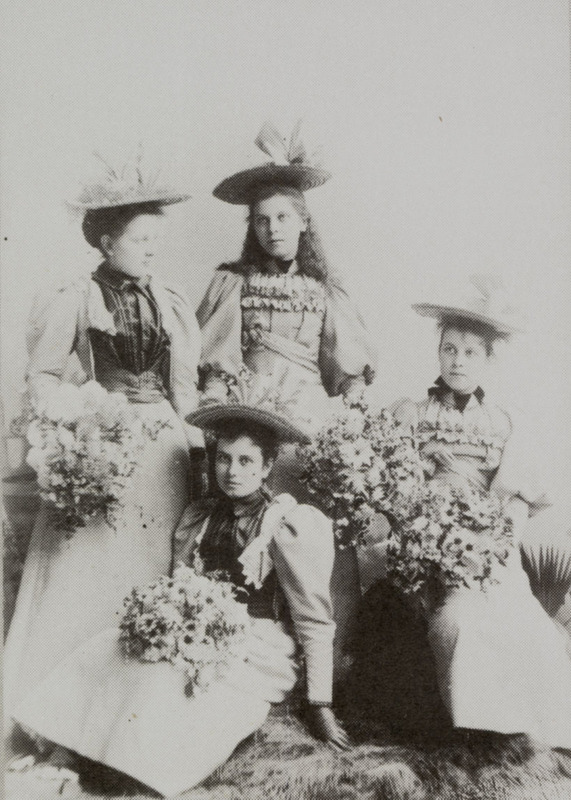 [ABOVE] This cabinet photograph of "The Misses Faulkner" by Gilbert Newton Futcher of Chichester, dating from February 1896, is probably a group portrait of the unmarried daughters of Ephraim Faulkner. One of these daughters, Laura Selina Faulkner, married Gilbert Futcher, the photographer of this group, in 1902. Fielder & Co were active as photographers in Chichester from 1866 to around 1887. George Fielder (1846-1914) was active as a photographer in Chichester and Worthing from around 1865 to 1882. John Fielder (born c1836) was active as a photographer in Chichester until around 1903. Both George Fielder and John Fielder were born in Fritham, a small village in Hampshire, between Fordingbridge and Cadnam, and it is likely that they were either brothers or cousins. John Fielder, the elder of the two Fielder photographers, was born in Fritham around 1836. John Fielder was a builder by trade and in 1866 he is listed as a "builder & undertaker" in North Street, Chichester. The first Fielder to have a business in Chichester appears to have been Thomas Fielder, who in 1851 was a plumber based in Orchard Terrace, Chichester. 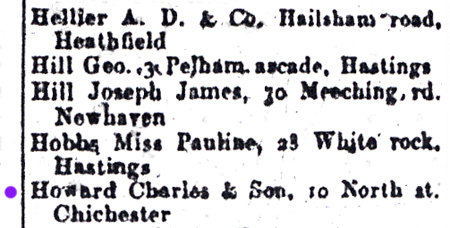 In Melville & Co.'s Sussex Directory of 1858, Thomas Fielder is listed as a plumber, glazier and painter working from Orchard Terrace in Chichester. 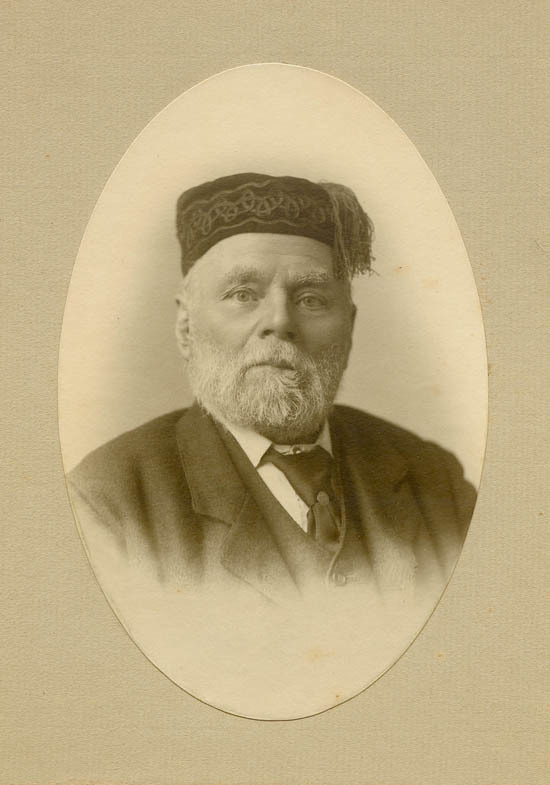 George Fielder, who was born in Fritham on 12th April 1846, was living in Chichester at No.13 Orchard Terrace at the time of the 1871 census, which seems to suggest a family connection with Thomas Fielder, the Chichester plumber. 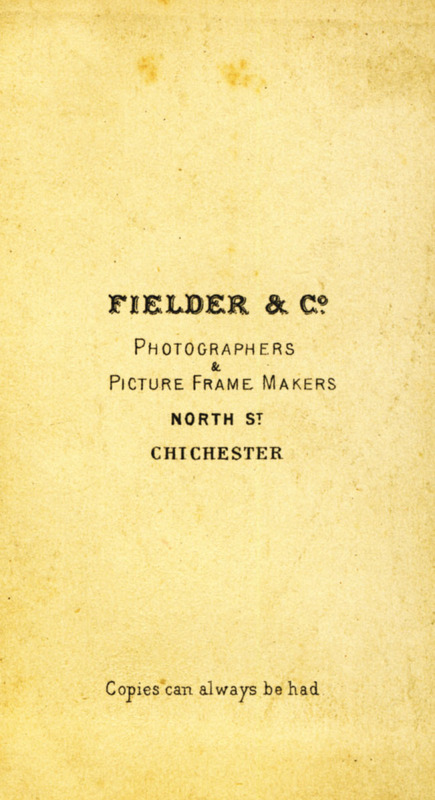 A firm of photographers called Fielder & Co. are listed with business premises in North Street, Chichester in the 1866 edition of Kelly's Post Office Directory of Sussex. 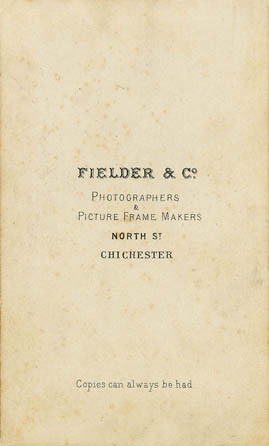 The backs of the cartes-de-visite produced by Fielder & Co. carry the words "FIELDER & Co, Photographers & Picture Frame Makers, North Street, Chichester". The trade directory of 1866 also details Fielder & Co. as a firm of stationers with a "Fancy Repository" in North Street. 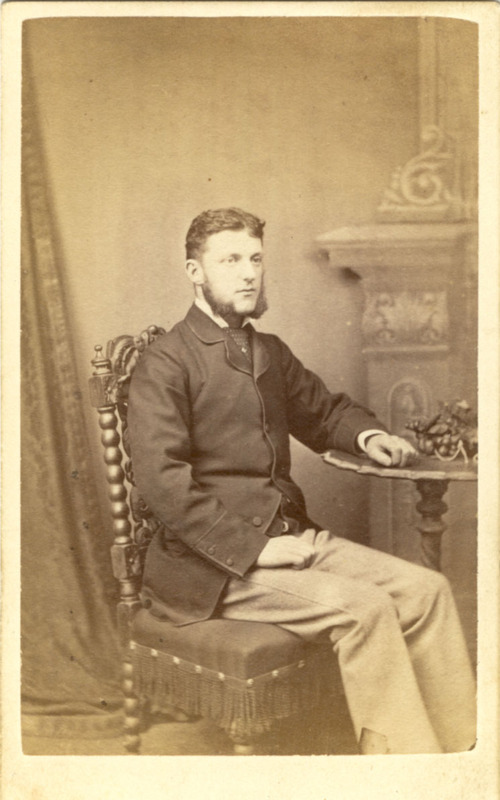 George Fielder must have been a junior member of the family firm in 1866, but there is evidence that he was primarily involved with the photography side of the business. The 1871 census, records George Fielder as a "Photographer's Shopman", aged 24, boarding at No.13 Orchard Terrace, Chichester. 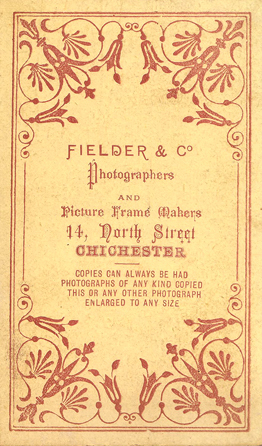 Photographs produced by Fielder & Co. in the 1870s carry the studio address of 14 North Street, Chichester. 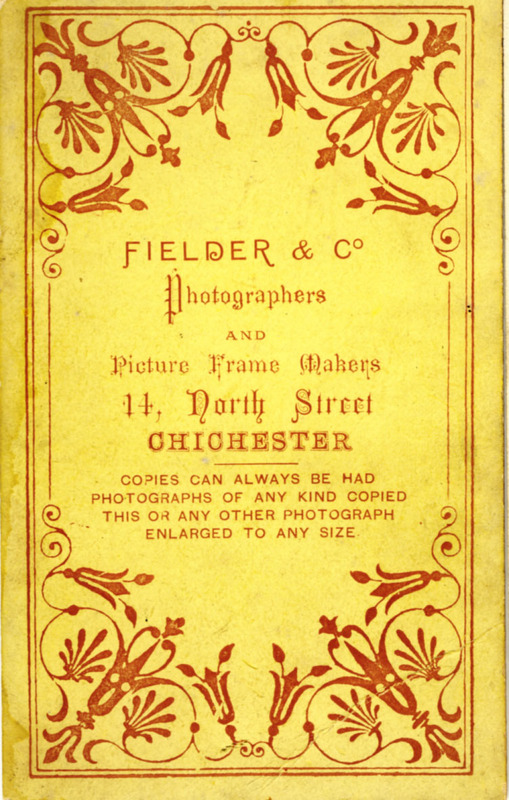 In the mid 1870s, the studio at 14 North Street, Chichester carried the name of The Chichester Photographic Co., but presumably the studio was still owned by Fielder & Co.
On 1st October 1872, at Funtington in West Sussex, George Fielder married Sarah Wilkins (born 19th March 1841, Ashling, Sussex), the daughter of William and Lucy Wilkins of Funtington. Sarah Wilkins' home parish of Funtington was situated 5 miles north-west of Chichester. A son named Ernest Fielder was born to George and Sarah Fielder in Chichester on 20th June 1875. Around 1877, Fielder & Co. decided to set up a branch studio in Worthing. The firm acquired the photographic studio at 16 High Street, Worthing, previously occupied by Josiah Russell (born 1839, Chichester) one of the sons of the well known Chichester photographer James Russell (1809-1899). George Fielder, together with his wife Sarah and two year old son Ernest, moved to Worthing to manage the Fielder & Co. branch studio. 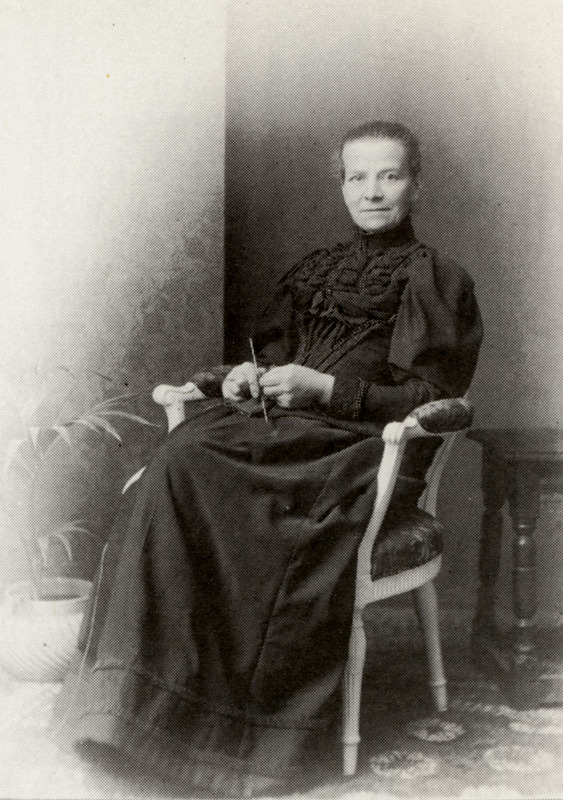 The transfer of Josiah Russell's Worthing studio to George Fielder may have been arranged by John Fielder, who had married Ruth Russell (born 1837, Chichester), Josiah's sister. John Fielder is known to have worked as a photographer for Russell & Sons in the latter part of his working career, but in the census returns for 1871 and 1881, he gives his main occupation as "builder", rather than "photographer". Initially, John Fielder must have been successful in the building trade, because in 1881, at the age of 45, he is described as a "Master Builder.. Employing 55 Men". At some point, John Fielder took over the running of his father-in-law's studio in Chichester. When the 1891 census was taken, John Fielder is shown residing with his wife Ruth at 65 East Street, Chichester, the photographic studio of Russell & Sons. The enumerator has entered John Fielder on the 1891 census return as both "Photographer" and "Employer". ( James Russell, the founder of the firm, would have been eighty-one years of age at the time of the 1891 census). No children are recorded in this or any other census, but, in the 1891 census, the 65 East Street address is shared by John Fielder's sister-in-law Mrs Esther RusselI, the wife of John Lemmon Russell who controlled Russell & Sons' London studios. In the 1901 Census, John Fielder, now aged 65, is recorded as still working as a photographer at the East Street studio. George Fielder managed Fielder & Co.'s Worthing studio for about four years until around 1881. A son and daughter were born in Worthing during this period - Nora Kate Fielder was born on 5th February 1877 and another child William Fielder arrived on 27th April 1879. When the 1881 census was taken, George Fielder and his family were living in Oving, three miles east from Chichester. George Fielder is described in the census return as a "Photographer", aged 34. It appears that George Fielder moved from Sussex to Wimbledon some time in the 1880s. The Chichester firm of James Russell & Sons had a branch studio at 28 Wimbledon Hill Road, Wimbledon, Surrey and it is thought that George Fielder was for a time employed as the manager of the Wimbledon branch. However, when the 1891 Census was taken, George Fielder is shown living at 15 Alexander Road, Wimbledon and he gives his occupation as "Photographer (Employer)" which suggests he had either become the proprietor of Russell & Sons' studio in Wimbledon or was running his own photography business in the town. Other sources indicate that George Fielder was operating a studio in Wimbledon under his own name in 1895. At the time of the 1901 Census, George Fielder, who is described as a "Photographer", aged 54, is shown living in North Wimbledon with his wife Sarah, aged 60, his twenty-four year old daughter Nora, and his two sons, Ernest, aged 25, and twenty-one year old William. Both Ernest Fielder and William Fielder worked as photographers in their father's Wimbledon studio. George Fielder died in 1914. His two sons, Ernest Fielder and William Fielder carried on the photography business. In 1928 the two brothers bought a booksellers and stationery business at 54 Wimbledon Hill Road, Wimbledon. Over seventy years later Fielders was still operating in Wimbledon, selling books, stationery, office supplies and art materials. [ABOVE] George Fielder (centre) and his two sons Ernest Fielder and William Fielder posing on the balcony of the Russell & Sons photographic studio at 28 Wimbledon Hill, Wimbledon around 1910. [ABOVE] The reverse of an early carte-de-visite portrait by Fielder & Co. of North Street, Chichester (c1866) . 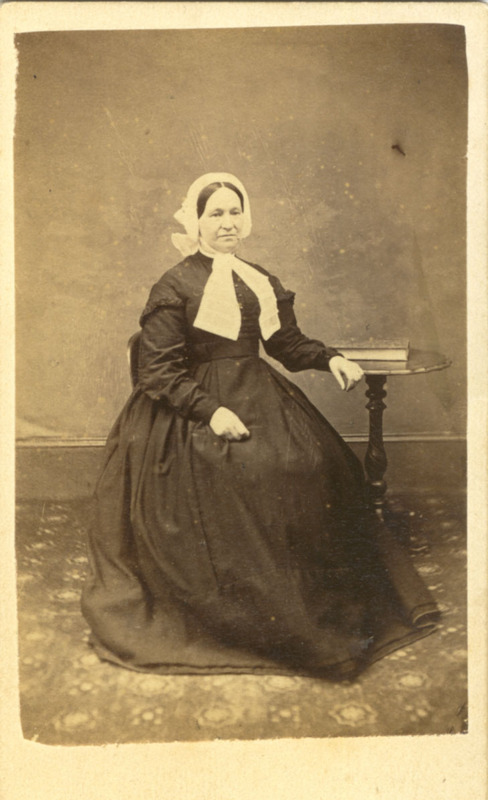 [ABOVE] An early carte-de-visite portrait of a seated woman by Fielder & Co. of North Street, Chichester (c1866). [ABOVE] A carte-de-visite portrait of a seated man by Fielder & Co. of North Street, Chichester (c1870). [ABOVE] The reverse of a carte-de-visite portrait by Fielder & Co. of 14 North Street, Chichester (c1883) . 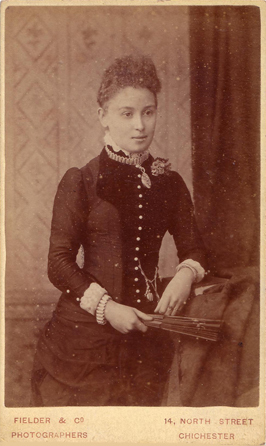 [ABOVE] A carte-de-visite portrait of a young woman holding a fan by Fielder & Co. of 14 North Street, Chichester (c1888). [ABOVE] The reverse of a carte-de-visite portrait by Fielder & Co. of 14 North Street, Chichester (c1888) . 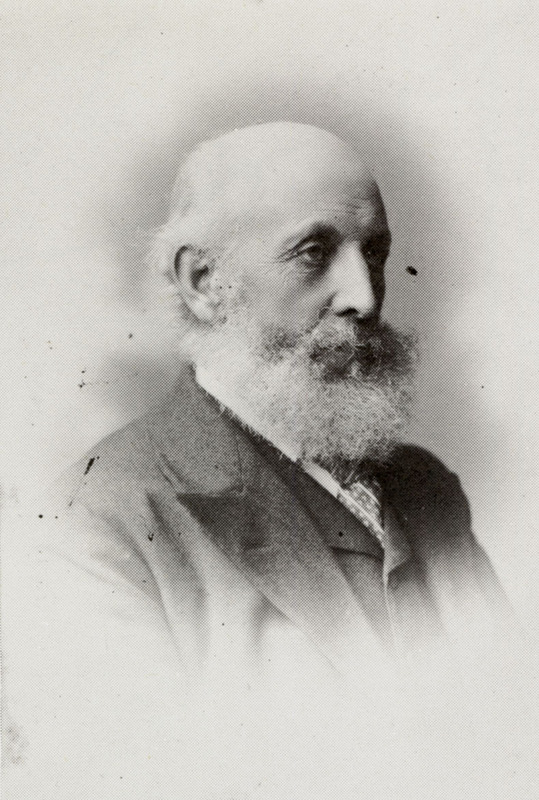 Click here to view examples of the photographic work of Fielder & Co.
[ABOVE] A photograph of Mr Fielder, George Fielder's father. 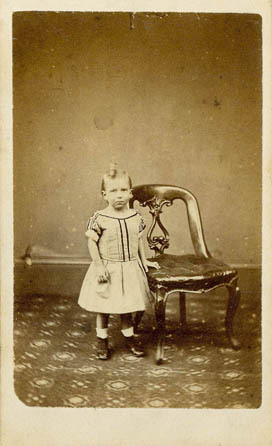 Written on the reverse of the photographic mount is the inscription "Pop's Grandfather Fielder"
[ABOVE] A photograph taken at Fielder & Co.'s Chichester studio around 1866 which was found in George Fielder's collection of family photographs. The child has not yet been identified. 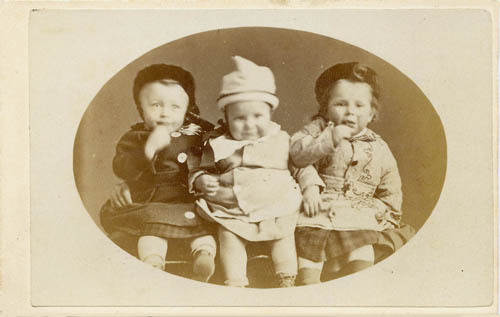 [ABOVE] A photograph taken at Fielder & Co.'s Worthing studio around 1880, which presumably shows George Fielder's three children - William Fielder (born 1879), Nora Kate Fielder (born 1877) and Ernest Fielder (born 1875). [ABOVE] Russell & Sons' photographic studio at 28 Wimbledon Hill Road, Wimbledon (at the junction with Worple Road), photographed around 1908. George Fielder with the assistance of his two sons Ernest Fielder and William Fielder, operated Russell & Sons' photographic studio in Wimbledon from the 1880s until his death in 1913. 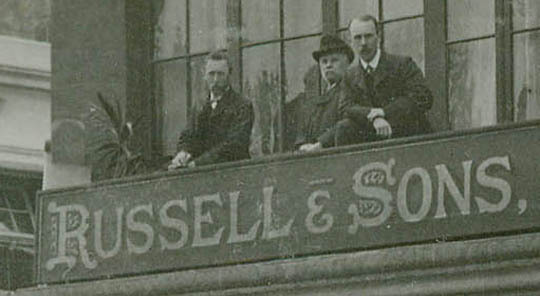 By 1911, Russell & Sons' Wimbledon studio had moved from 28 Wimbledon Hill Road to 19 Worple Road. The 1911 census, records George Fielder as a sixty-four year old "Photographer" at 19 Worple Road, Wimbledon. 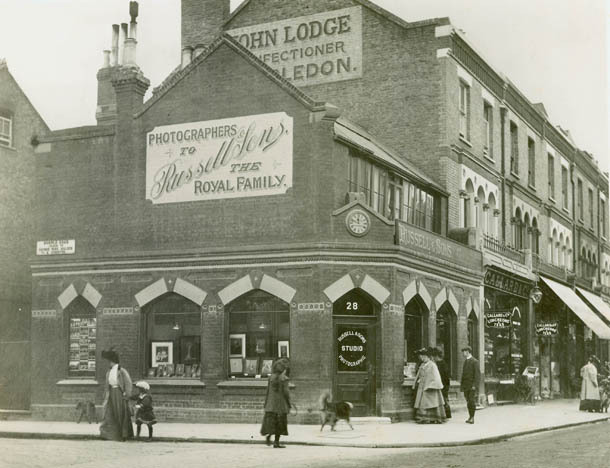 [ABOVE] Russell & Sons' photographic studio at 28 Wimbledon Hill Road, Wimbledon photographed around 1908. On the balcony, in front of the glass-walled studio on the first floor of the building, stands George Fielder and his two sons Ernest Fielder and William Fielder. To the left of Russell & Sons' studio is Joseph Ely's store at 22, 24 & 26 Wimbledon Hill Road. Joseph Bird Ely (born c1844, Cavendish, Suffolk) was a draper & outfitter who gave his name to Ely's Corner in Wimbledon. Active as a photographer in Chichester between 1895 and 1898. Gilbert Newton Futcher was born in Newport on the Isle of Wight in 1868 [ birth registered during the First Quarter 1868]. Gilbert was the second child and eldest son of Emma and Henry Futcher. It appears that Gilbert and his sisters had lost both parents by 1878. At the time of the 1881 census, Gilbert Newton Futcher and his sister Mabel Ethel Futcher (born 1871 Southampton, Hampshire) were staying with relatives in Downton, Wiltshire*. They were visiting the home of Charles Futcher (born c1827 Downton, Wiltshire), a tailor of High Street, Downton. Frederick Futcher (born c1862, Salisbury, Wiltshire), who was possibly related to Gilbert, was working as a "Photographer - Manager" at 12 Silver Street, Warminster in Wiltshire when the 1881 census was taken. Around 1889, Frederick Futcher set up his own photographic studio at 36 High Street, Warminster, where he remained until around 1906. From 1907, Frederick Futcher was operating a studio in Salisbury at 19 Fisherton Street. Gilbert Newton Futcher established a photographic studio in Chichester at 32 East Street in 1895. The following year, Gilbert Futcher moved to new premises at 28 North Street, Chichester. 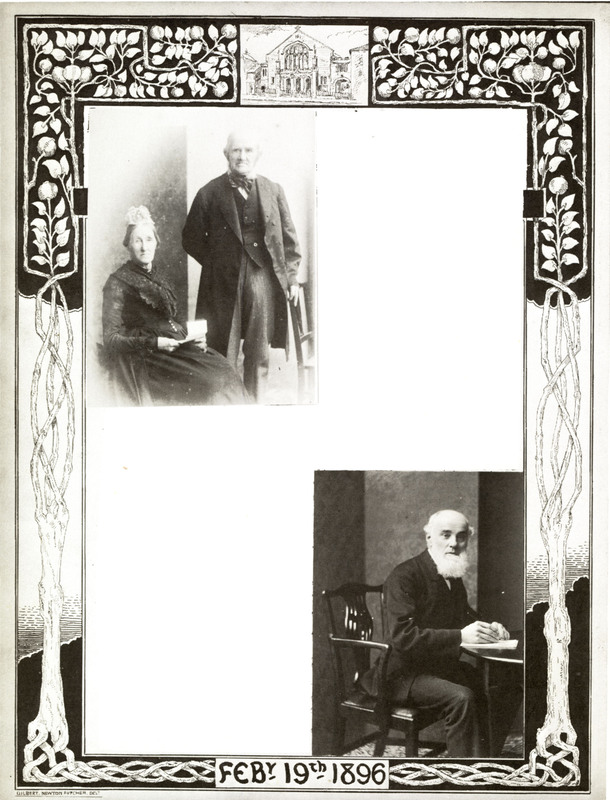 During his stay in Chichester, Gilbert Futcher appears to have associated with members of the Congregational Church and early in 1896 he was commissioned to produce an album of photographic portraits to present to the Pastor of the Church. The photograph album, containing portraits of members of the Congregational Church, with pages decorated in pen and ink by Gilbert Futcher himself, was presented to the Pastor on 19th February 1896. One of the church members photographed by Futcher was Laura Selina Faulkner (born 1873, Chichester), a daughter of Ephraim John Faulkner (c1835-1908), a carver & gilder who had operated a photographic studio in Chichester in the 1860s (see above). Gilbert Newton Futcher married Laura Selina Faulkner in 1902 [ Marriage registered in Chichester in the December Quarter of 1902 ]. Previous to his marriage, Gilbert Futcher was residing in Bournemouth. At the time of the 1901 census, Gilbert N. Futcher is recorded at an address in Bournemouth and is described as a "Portrait Photographer", aged 33. Gilbert Newton Futcher's photographic business at 28 North Street, Chichester failed and he was declared bankrupt in October 1898. Despite his early bankruptcy, Gilbert Newton Futcher went on to have a long career as a professional photographer. In the 1920s, Gilbert N. Futcher operated a photographic studio at 84 Palmerston Road, Southsea and in Kelly's Directory of 1939, he is listed as a photographer with a studio at 18 Church Street, Christchurch, Dorset. Gilbert Newton Futcher died in Surrey in 1942 at the age of 74. [The death of Gilbert N. Futcher was registered in the district of South West Surrey during the 4th Quarter of 1942]. [ABOVE] A carte-de-visite portrait of a young boy by Gilbert Newton Futcher of 32 East Street, Chichester (c1896). 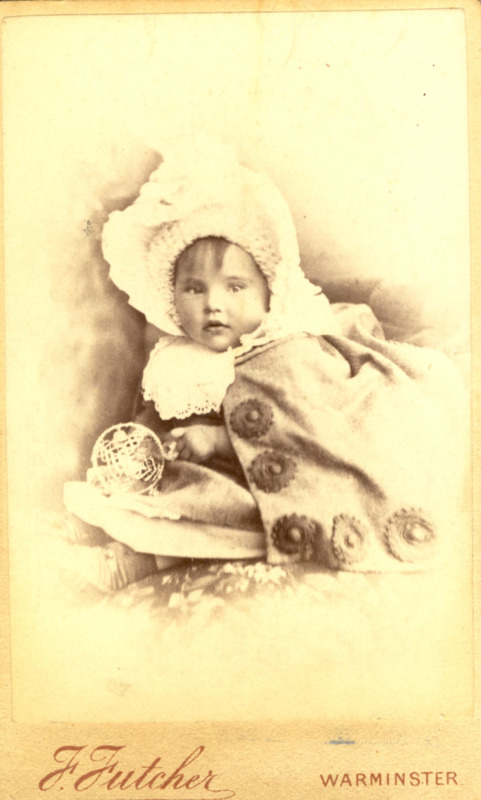 [ABOVE] A carte-de-visite portrait of a young child by Frederick Futcher of 36 High Street, Warminster (c1889).There is a possibility that Frederick Futcher was related to Gilbert Newton Futcher. [ABOVE] A decorated page from the photograph album prepared by the photographer Gilbert Newton Futcher for the Congregational Church in South Street, Chichester (Album dated February 19th, 1896). The couple at the top left are Mr. & Mrs Heath, church caretakers. The man seated at the desk, pen in hand is the church secretary, Mr. James Hilton. Gilbert Futcher decorated the pages with his own pen and ink art work. Gilbert Newton Futcher, Photographer of 28 North Street, Chichester, underwent his public examination at the Brighton Bankruptcy Court on November 3rd (1898). The debtor stated that he commenced business in 1895, having a capital of �10 (pounds sterling) in cash and apparatus. To this he added �50 (pounds sterling), which he borrowed from a friend. His books at the end of the first year showed a deficit of �80 (pounds sterling), and although his business had increased he had not been able to make it pay, and the �50 (pounds sterling) borrowed in 1895 was still owing. [ABOVE] Extract from the trade journal "The Photographic Dealer" detailing the bankruptcy proceedings against Gilbert Newton Futcher of 28 North Street, Chichester (1898). [ABOVE] A detail from a decorated page of the South Street Congregational Church Photograph Album showing the name of the photographer and artist Gilbert Newton Futcher, who decorated the album pages with his own pen and ink art work. Charles (Charley) Howard was born in Andover, Hampshire, in 1863. [The birth of Charley Howard was registered in Andover during the 4th Quarter of 1863]. Charles Howard was one of eight children born to Ann and John Howard, a carpenter of Andover. In 1851, John Howard (born 1825, Smannell, near Andover, Hants.) married Ann Holloway (born 1827, Andover, Hampshire) in Andover. A number of children were born to the couple between 1851 and 1872, eight of whom survived infancy - Henry (born 1852), Ann (born 1855), George (born 1857), Maria (born 1859), Ellen Mary (born 1861), Charley (born 1863), William (born 1866) and Kate Howard (born 1871). At the time of the 1881 census, seventeen year old Charles (Charley) Howard was working as an �engine fitter� and living with his parents and two younger siblings at Folly Cottages, Charlton Road, Andover, Hampshire. Towards the end of 1882, at Andover, Charlie Howard, who was then in his late teens, married Sarah Longman (born 1859, Goodworth Clatford, near Andover, Hants. ), a twenty-three year old domestic servant. It appears that Charles Howard had set himself up as a taxidermist and picture-frame maker at 53 London Street, Andover. By 1890, Charles Howard had established a photographic studio at 53 London Street, Andover. (In Kelly�s Directory of Hampshire, published in 1890, Charles Howard was listed as a professional photographer at 53 London Street, Andover). By 1895, Charles Howard had moved his business to Andover�s High Street. In the 1895 edition of Kelly�s Directory of Hampshire, Charles Howard is recorded as a professional photographer in the High Street of Andover. Until 1899, Charles Howard was working as a photographer at 72-74 High Street, Andover. During their marriage, Charles Howard and Sarah Longman produced at least 8 children: Henrietta (born 1883), Charlie (born 1885), Edith Sarah (born 1887), Eva (born 1890), Percy (born 1890), Ernest Edward (born 1892), Eveline Maud (born 1895) and Leslie Harold Howard (born 1899). When the 1901 census was taken, Charles Howard senior was operating a photographic portrait studio in High Street, Andover. Charlie Howard (born 1885, Andover), Charles Howard senior�s eldest son, was already working as a photographer in 1901. By 1903, Charles Howard senior was operating a photographic portrait studio at 81 High Street, Andover. Around 1906, Charles Howard senior brought his eldest son Charlie Howard into the business to form the firm of Charles Howard & Son. At the time of the 1911 census, Charles Howard senior and his family were residing in the living quarters attached to the studio at 81 High Street, Andover. The census return describes Charles Howard as a forty-eight year old �Photographer and (Picture) Frame Maker�. Two of Charles Howard�s children, Edith Sarah Howard (born 1887, Andover) and Percy Howard (born 1890, Andover) staffed the Howard & Son studio in Andover. Both twenty-three year old Edith and twenty-one year old Percy are entered on the census return as assistant photographers. Charles Howard senior ran the photographic studio at 81 High Street, Andover until his death in 1921 at the age of 57. After Charles Howard senior�s death in 1921, Howard & Son�s studio in Andover was presumably run by his daughter Edith Sarah Howard (born 1887, Andover) with the assistance of her younger brothers. Between 1920 and 1931, the firm of C. Howard and Son were listed in local trade directories as photographers at 81 High Street, Andover. Edith Sarah Howard took a leading role in the firm of Howard & Son during the 1920s. When Kelly�s Directory of Hampshire was published 1935, Miss Edith S. Howard was listed as the proprietor of Howard�s original photographic portrait studio at 74 High Street, Andover. In 1959, Edith S. Howard was still listed as the proprietor of the studio at 74 High Street, Andover. From 1959 until 1969, the photographic studio at 74 High Street, Andover went under the name of �Howards of Andover�. It appears that the firm of of �Howards of Andover� continued to trade up until the 1980s. Charlie Howard was born 1885 in Andover, Hampshire, the eldest son of Charles (Charley) Howard and Sarah Longman. [The birth of Charlie Howard was registered in Andover during the 4th Quarter of 1885]. Charlie Howard received instruction in photography from his father Charles Howard senior, who had been running a photographic portrait studio in Andover since 1890 or earlier. At the time of the 1901 census, fifteen year old Charlie Howard was working as a photographer in Hampshire. Charlie Howard eventually joined his father in his photography business and from around 1905 the studio at 81 High Street, Andover, went under the name Charles Howard & Son. 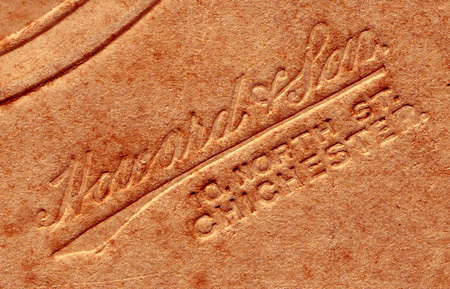 By 1907, Charlie Howard had moved from Andover to Chichester in West Sussex to establish a branch studio of Howard & Son. The 1907edition of Kelly�s Directory of Sussex lists the studio of Howard & Son at 10 North Street, Chichester. Charles Howard senior operated Howard & Son�s studio at 81 High Street, Andover, with the assistance of his daughter Edith Sarah Howard (born 1887, Andover) and his son Percy Howard (born 1890, Andover), while his eldest son Charlie Howard managed the branch studio at 10 North Street, Chichester. Early in 1911, Charlie Howard married Amy Muriel Holt in Chichester. [The marriage of Charlie Howard to Amy Muriel Holt was registered in Chichester during the 1st Quarter of 1911]. The 1911 census recorded Charlie Howard and his young wife in the living quarters attached to the studio at 10 North Street, Chichester. Over the next decade, Mrs Muriel Howard gave birth to three children in Chichester � Muriel (born 1911), Charlie (born 1916) and Grace Howard (born 1920). The firm of Charles Howard & Son remained at 10 North Street, Chichester until at least 1938. Charlie Howard died in Chichester in 1950 when he was in his mid-sixties. [The death of Charlie Howard was registered in Chichester during the 1st Quarter of 1950]. 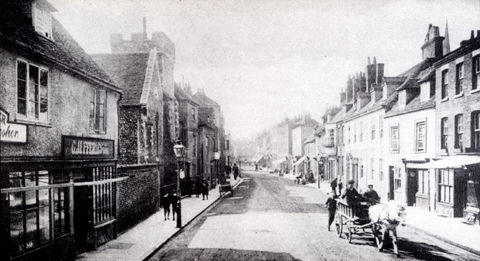 [ABOVE] A photograph taken in 1908 showing North Street, Chichester, where the photography firm of Charles Howard & Son operated a photographic portrait studio from 1907 until 1938. [ABOVE] Charles Howard & Son of 10 North Street, Chichester, in the listing of professional photographers in the Trades Section of Kelly's Directory of Sussex published in 1922. The firm of Charles Howard & Son was established around 1906 when Charles (Charley) Howard (born 1863, Andover) brought his son Charles (Charlie) Howard (born 1885, Andover) into the family photography business. Although listed as "Charles Howard & Son", the real name of the founder of the firm was Charley Howard and his son's name was registered at birth as "Charlie Howard". The head of the firm, Charley Howard died in 1921, the year that the 1922 edition of Kelly's directory was compiled, but his son Charlie Howard (1885-1950) retained the studio name of Charles Howard & Son until the Second World War. [LEFT] The photo credit "Howard & Son, Andover" written in pencil in the bottom right-hand corner of the postcard portrait illustrated above. The portrait was photographed around 1918 at the Andover studio of Charles Howard & Son. 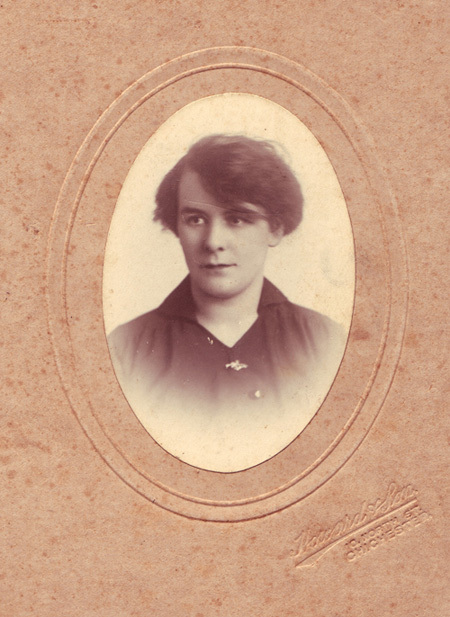 Winifred Kathleen Smith was born in Woolwich, Kent in 1886. [The birth of Winifred Kate Smith was registered in the district of Woolwich during the 1st Quarter of 1886]. Winifred's father, Thomas Smith (born c1857, Birmingham) was a "Driver in the Royal Artillery". Her mother, Clara Frances Woods, was born in Landport (Portsea) in 1863. Winifred Smith had two brothers - Jesse Philip Smith, (born 1884, Portsmouth) and Alfred Thomas Smith (born on 1887, Aldershot). Sadly, Winifred's mother, Mrs Clara Smith, died at the age of 23 on 27th March 1887 at South Camp, Aldershot, a month or so after giving birth to Winifred's youngest brother. 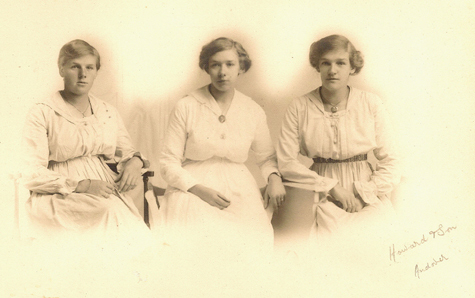 After their mother's early death, Winifred and her two brothers were raised by relatives. At the time of the 1901 census, fifteen year old Winifred K. Smith was employed as a domestic servant in the household of Harriet & John Grist at No. 3 The Hornet, Chichester. In 1901, John Grist, who was born in Chichester in 1845, was earning his living as a �Fly Proprietor� (i.e. the owner of a fleet of horse-drawn carriages which could be hired out to the public. A �Fly� was usually a swift, light-weight, two-wheeled carriage drawn by a single horse). When the 1911 census was taken some ten years later, Winifred Kathleen Smith was still living at John Grist�s house in The Hornet, but this time she is described as a twenty-five year old "boarder" rather than a domestic servant. 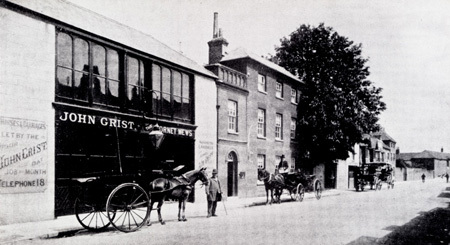 [ABOVE] John Grist's horse & carriage business at Richmond House, 3 The Hornet, Chichester, where Winifred Kate Smith lived and worked between 1901 and 1915. Sometime between 1915 and 1917, Winifred Smith married a Mr Streeter, but he appears to have died within a few years of their marriage. On 23 October 1920, at Woolwich Register Office, Winifred Kathleen Streeter, a thirty-four year old widow, married William Saville (born 1874, Woolwich), a stevedore in the local docks. The marriage of Winifred and William Saville produced one child, a son named Gordon William Saville (born 1921,Woolwich). Mrs Winifred K. Saville died on 27th February 1962 at Brook General Hospital, at the age 76. [ABOVE] The trade plate of Charles Howard & Son of Chichester impressed into the corner of the studio portrait of Winifred Kathleen Smith illustrated above. The trade plate gives the studio address as 10 North Street, Chichester. John Grist has been described as a "well-known Chichester character". Born in Chichester during the 1st Quarter of 1845, John Grist married Harriett Ann Ryan (born 1851, Chichester) in 1868. In April 1876, John Grist was described as an "Innkeeper, Fishmonger and Greengrocer" at the Cattle Market Inn, Eastgate, Chichester. At the time of the 1881 census, thirty-six year old John Grist was residing at No. 5 The Hornet, Chichester, and earning his living as a dealer in "fruit & fish". John and Harriett Grist�s daughter, Harriet Louisa Grist died in infancy on 18th July 1872. In a trade directory published in 1890, John Grist is listed as a publican and fishmonger at The Prince Albert public house. By 1899, John Grist was hiring out horses and carriages from Richmond House in Chichester�s Hornet. Without any surviving children, John Grist shared his home with his wife�s sister and various nephews. John Grist�s nephews assisted him in his horse & carriage business at The Hornet. In the 1915 edition of Kelly�s Directory of Sussex, John Grist is recorded as a "Jobmaster" at No. 3 The Hornet, Chichester (Note: a �Jobmaster� hired out horses and carriages to the public). John Grist died in Chichester on 28th November 1916, aged 71. 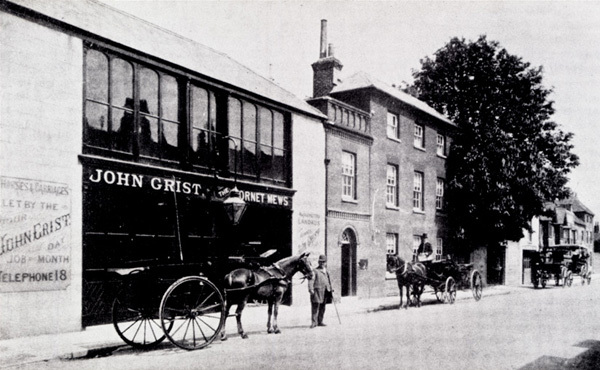 [LEFT] John Grist's horse & carriage business at Richmond House, The Hornet, Chichester, photographed in 1907 by the Chichester photographer Frederick Henry Robinson. 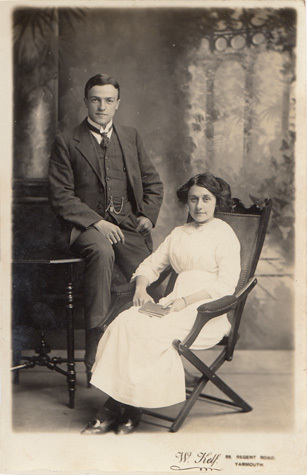 [ABOVE] A postcard portrait of a young couple, photographed by Walter Kelf at his studio at 89 Regent Road, Great Yarmouth (c1916). 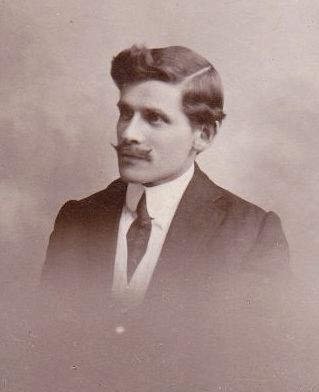 Walter Kelf ran a studio at 89 Regent Road between 1911 and 1916. Walter Kelf was born at Great Yarmouth, Norfolk in 1876, the son of Hannah Elizabeth Cracknell and Joseph Kelf, who worked as an "Overlooker in Silk Crape Factory" (probably Grout's Silk Factory in St Nicholas Road, Yarmouth). Early in his working life, Walter Kelf was involved in photography. The 1891 census records 14 year old Walter Kelf as a "Photographer's Apprentice". In 1898, Walter Kelf married Caroline ('Nina') Naomi Jordan (born 1874, Great Yarmouth) the daughter of Anne Jordan, a lodging house keeper. On 12th March1900, Walter and Nina Jordan became the parents of a son named Albert Walter Kelf. [The birth of Albert Walter Kelf was registered in Yarmouth during the 2nd Quarter of 1900]. By 1901, Walter Kelf was employed as a 'Photographic Artist' in Great Yarmouth. The 1901 census records Walter Kelf and his wife and child residing at 9 Manby Road, Great Yarmouth. On the census return 25 year old Walter Kelf is described as a "Photographic Artist" (worker) which indicates that he was employed at an established studio. 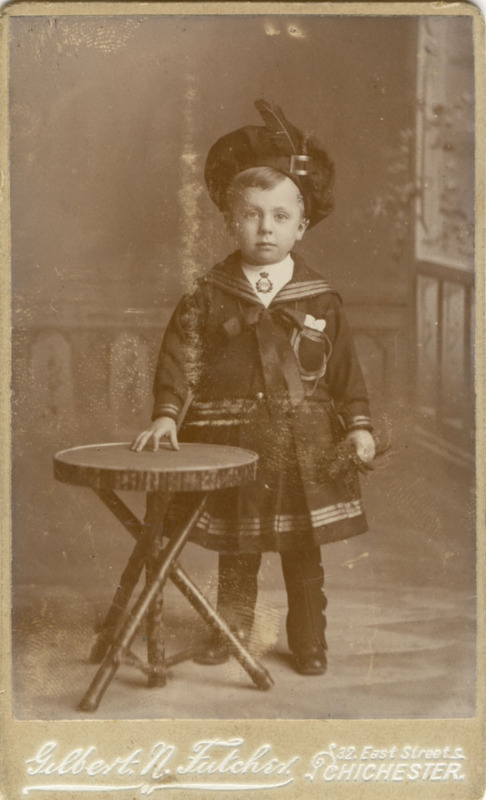 In 1907, Mrs Nina Kelf gave birth to their second child, Arnold Frank Kelf. [The birth of Arnold Frank Kelf was registered in Yarmouth during the 4th Quarter of 1907]. The couple's third child Muriel Kelf was born at Yarmouth on 13th July 1910. By the time the census was taken on 2nd April 1911, Walter Kelf was running his own studio at 89 Regent Road, Great Yarmouth. On the 1911 census, 34 year old Walter Kelf describes himself as a "Photographer, own account, at home". In trade directories, Walter Kelf is listed as a professional photographer at 89 Regent Road, Great Yarmouth between 1912 and 1916. Walter Kelf's photographic career was interrupted by the First World War, when it appears he served as a driver in the Royal Field Artillery. At the end of the First World War, Walter Kelf arrived in Chichester to take over the former studio of William Pankhurst Marsh (1850-1918) at 39 Southgate, Chichester. Walter Kelf operated the photographic studio at 39 Southgate, Chichester until his death in 1923. [Walter Kelf died at Chichester on 2nd February 1923 at the age of 46]. It appears that Walter's eldest son, Albert Walter Kelf (born 1900), had joined his father in his photography business around 1919 when the firm became known as Kelf & Son. After his father's death Albert Kelf continued as a photographer at 39 Southgate, Chichester, but by 1928 the studio of Kelf & Son had closed. 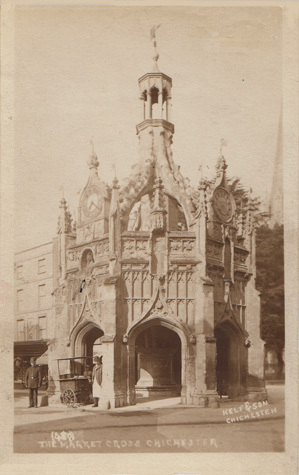 [ABOVE] A view of The Market Cross, Chichester (probably from an original photograph by W. P. Marsh) issued as a postcard by Walter Kelf & Son of 39 Southgate, Chichester around 1920. 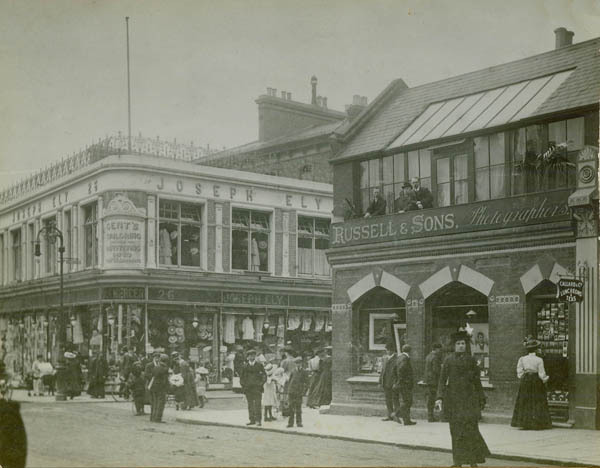 [ABOVE] Walter Kelf's business premises at 89 Regent Road, Great Yarmouth, Norfolk (c1912). 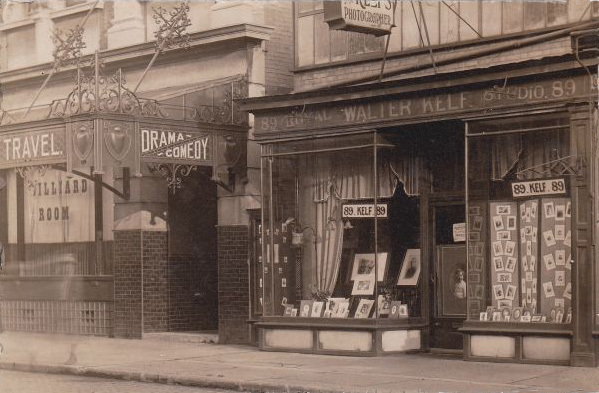 Walter Kelf operated a photographic studio at 89 Regent Road, Yarmouth, between 1911 and 1916. [ABOVE] Walter Kelf (1876-1923) worked as a professional photographer in Great Yarmouth and Chichester. 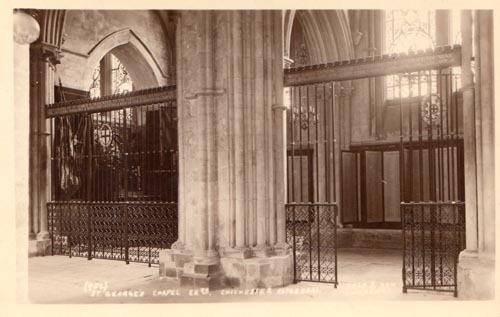 [ABOVE] St George's Chapel, Chichester Cathedral, a picture postcard produced by Walter Kelf & Son of 39 Southgate, Chichester (c1920). After Walter Kelf took over the former studio of William Pankhurst Marsh at 39 Southgate, Chichester around 1919, he began to publish picture postcards depicting views of the cathedral city (e.g. Chichester Cathedral; The Market Cross; Pallant House). A number of the pictures, although carrying the credit "Kelf & Son, Chichester", were produced from the original prints and negatives of the photographer William Pankhurst Marsh (1850-1918) who had previously operated from the studio at 39 Southgate, Chichester. By the early 1920s, Walter Kelf and his son Albert Walter Kelf (born 1900) were probably issuing their own photographs as picture postcards, but their output was not great as Walter Kelf died early in 1923. I am grateful to Janelle Fischer who kindly provided the Howard & Son's photographic portrait of Winifred K. Smith and supplied information about the subject's family. The portrait of Winifred K. Smith by Charles Howard & Son was sent to Winifred's younger brother Alfred Thomas Smith (1887-1976) who had emigrated to Australia in 1891. Janelle Fischer is the grand-daughter of Alfred Thomas Smith (known as Frederick West in Australia). Winifred K. Smith's elder brother, Jesse Philip Smith (1884-1971) eventually settled in Pennsylvania, U.S.A., where, under the name of Philip Jesse West, he established a successful freight business. Thanks to Nigel Dowe who kindly supplied the portrait of of the photographer Walter Kelf and the picture of Kelf's studio premises in Regent Road, Yarmouth. Nigel Dowe is related to Walter Kelf through the photographer's wife Caroline 'Nina' Naomi Jordan (1874-1945). Additional material and information about Walter Kelf's life and photographic career has been provided by Rendel Williams of the Sussex Postcards Info website.